I’ll admit, I had a hard time figuring out what to title this post. I am dedicated to making people love themselves entirely. Good, bad, “ugly,” and all! I think I am most passionate about this because as I get older, and experience more of all the bizarre, amazing, and ridiculous parts of life, I have learned that I owe it to me to be positively, absolutely, and madly in love with myself. It’s been a journey, to say the least. I started out pretending not to care what people thought. Pretending that their mean words, loud whispers, and cruel jokes didn’t bother me. Telling myself that even though I knew that they were right, I wouldn’t let them ever know I believed anything they said. But then, a funny thing happened…it all became so….real. A series of events, from my first legit to heartbreak, to breaking my first heart….being and my highest weight, and being the smallest I’d ever been….I found that there is so much more to life than focusing on what anyone else has to say about my life, how I live it, and how I decide to look while I do. When I really think about it, I’ve always had a handful of amazing friends. I’ve always been complimented for my smile, my intelligence, and my funny facial expressions while I tell stories(although, I tend to think the stories are funnier, if I do say so myself! ), and sometimes I’m even acknowledged as a half decent person! I’d rather love myself for my good parts, versus the bad others choose to see when they merely look at me for the first time. In fact, I think it says more about them, than me. And so, I set out to show myself that I didn’t have to fake it anymore. No more pretending. It was time to acknowledge that I AM awesome. And I am only human, but I’m not a crappy human, and that’s enough for me. So, I figured maybe I’d share some of the ways I do this-honor myself, love myself, and remind myself that at the end of the day….if I’m going to be my toughest critic, I am going to be my biggest cheerleader, too! 1. Write a list of 10 things you love/appreciate about yourself, or your life, that don’t involve your weight or flaws.Focus on the positive. Because after all, you’re awesome! 2. Focus on goals that take you out of your comfort zone and create experiences that you can treasure forever (like with my “27 Things for My 27th Year” project). 3. Remind yourself of all that your body can do. I went ziplining once. Also, I recently did a 15K with a friend, and have plans to go skydiving before my next birthday. 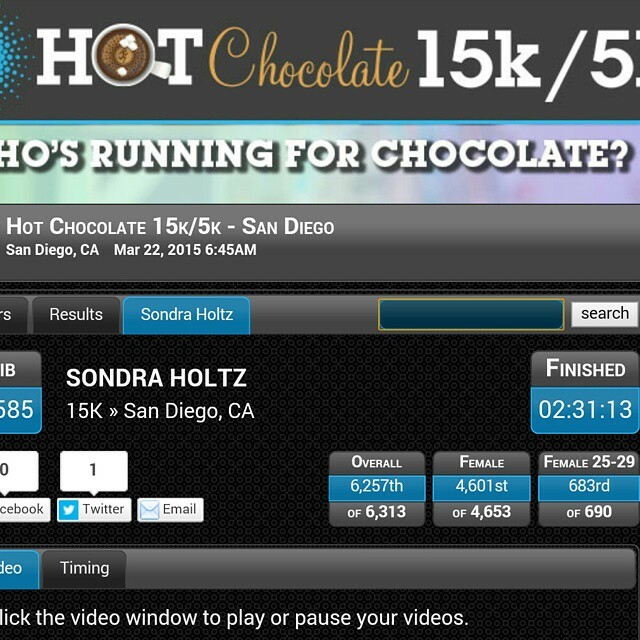 Ask the old pretending Sondra if she ever would have registered for a run. On purpose. HA! 4. Spend some quality time with yourself. You carve out time for everyone that’s important to you. Block your schedule and go to a matinee alone, take a spa day, splurge on the more expensive pedicure and read gossip magazines…whatever makes you happy….try it solo and connect with yourself. 5. Surround yourself with positive people. Life is way too short for people who never have anything nice/helpful/supportive to say. It took me WAY too long to realize I don’t need to feel obligated to deal with it. 6. Distance yourself from exhausting people, too. Negativity isn’t the only thing that can drain you and affect your stress level or mood. People who ask for the same advice and never take it; people who lean on you to solve their problems; people who depend on you for your unwavering loyalty but never return the favor? You don’t need them around all the time, either. They’ll be fine without you. Trust me on this! 7. Remember that true beauty is a state of mind. No cream, serum, lip gloss, eyelash extensions, yoga pants, or diet regimen can make you worthy of adjectives like “compassionate,” “kind,” “thoughtful,” or “amazing.” Don’t limit your beauty to materialistic and aesthetic features. Kate Spade can’t sell you a beautiful soul (ahem, but if your awesome mom was in town for a week and bought you a pretty one with watercolor lemons all over it? SCORE. Thanks, mom!). 8. Use the time and energy you’d normally spend criticizing facets of your life to help others. Your weight, your grades, your features, your progress towards your future…it may never measure up to your high expectations. But the time you spent helping others will remind you of all you have, all you have done, and all the good there can be in the world. 9. Be mindful of the messages all around you. The “perfect” Victoria’s Secret bikini body, the idea that flat abs and blonde hair are the only tools you need to succeed. These messages are subtly (and sometimes not so subtly) permeating our lives with ideals that aren’t generally achievable if you’ve got a job, an education to pursue, and/or family obligations. Realize that you’re more than what the magazines say you can buy, and know your worth lies in the impact you make-not whether or not you have a 4 pack and strappy bathing suit. 10. Ask yourself, “Why do I feel like I have to be somebody else?” There are so many people who love you without all the frills. My aunt sat me down when I was 15 or 16 and asked me why I didn’t feel like I could be myself. I think I cried every night for a week, knowing that my secret Little Debbie snacks and wrappers under my bed had been discovered. I grew up with my dad restricting my food intake and criticizing my weight when we had to shop in the women’s section at stores. 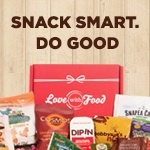 I felt like wanting snacks made me uglier, and bad. That question has never left me. It helped me get to where I am today. And whether I am making kale chips, or eating donuts, I know that those I surround myself with aren’t paying attention to my plate. They love ME. The girl behind the plate. These are just some of the ways I remind myself everyday that I am more than a size on a tag, or a self-proclaimed Body-Positive Activist. Spend a little extra time loving yourself here and there, and I promise it becomes second nature. 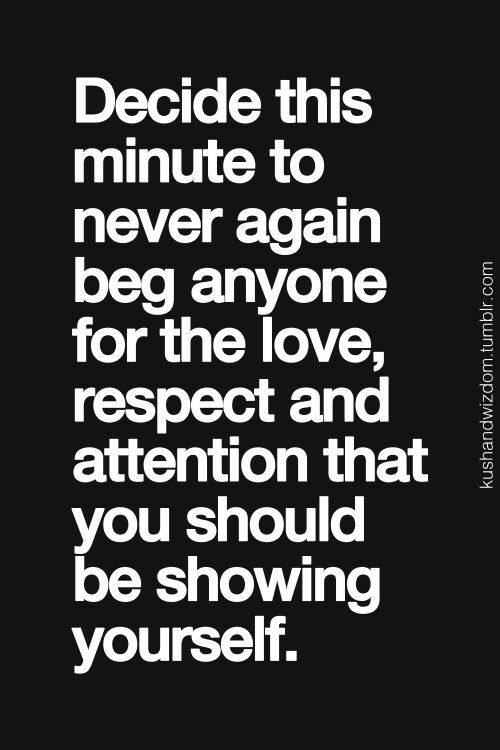 But learn from my experience, and make it genuine from the beginning. Because you and I are worth every praise, every calorie, and every champagne toast. We are amazing, beautiful, inspiring, and brilliant. And there is no measure of body weight or material items that could possibly calculate the extent of it. If you’ve been following SeeSondraSlim, you know my big mission these days is knocking 27 tasks off a list I created to commemorate my 27th year on Planet Earth. In order to achieve this, obviously I have to do at least two things a month (sometimes 3) from this most auspicious list! March 7th, the list kicked off with my Sunrise Hike up Cowles Mountain, and this today, I’ve officially completed #19: The Hot Chocolate 15K. I’m a little terrified admittedly. I have completed a few 5K’s so far, but never anything longer. 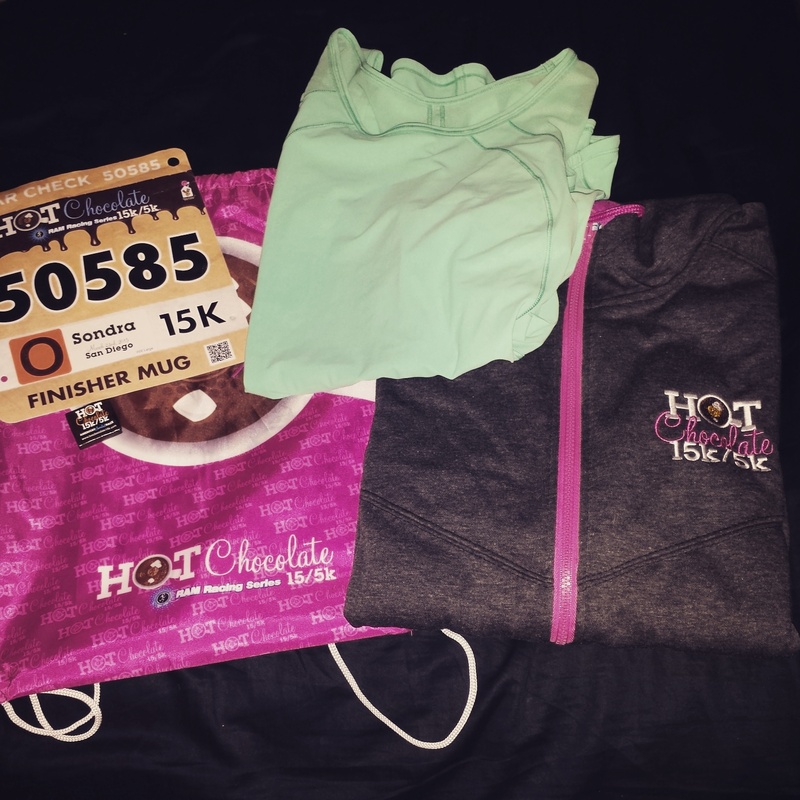 However, if you’re familiar with this particular race, you know there is historically always an adorable hoodie and a pot of melted chocolate for you at the finish line. 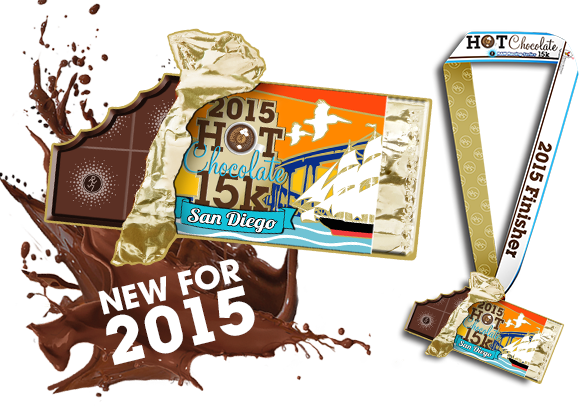 Bonus: 15K racers got an awesome medal that looks like a partially wrapped chocolate bar! I was really fortunate to have two amazing ladies with me to cross the finish line! I love you, Ashley and Kalyca! I set out knowing that this would be tougher for me, being that I’m more of a “stretch yourself into awkward positions for exercise” type of girl, but I am proud to say that we killed that course, even if we weren’t the fastest or most athletic group out there! Turns out, I finished in 2:31:13….not bad for walking a LOT of it, and all those Downtown SD hills! I got to the finish line, and learned they were OUT of medals. Yeah, you read that right. One of the major reasons I went from doing comfy 5K runs was to get a damn medal! And nooooo. I get there, and there are like 4 conflicting stories as to why there isn’t one for me. 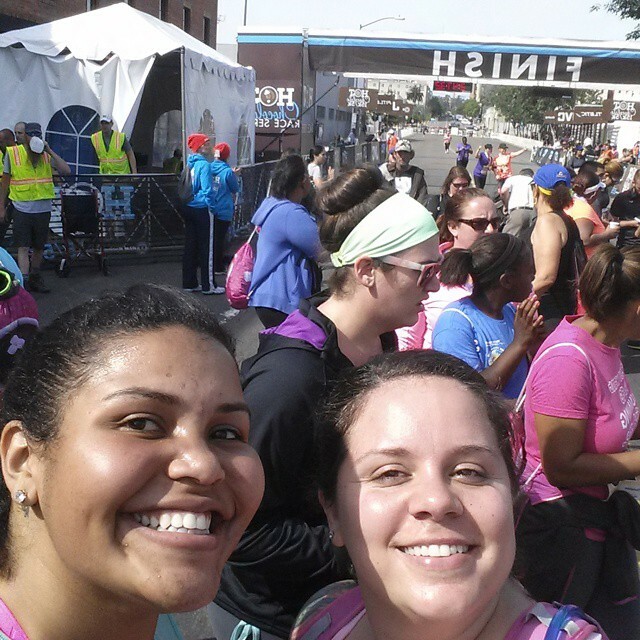 Past the finish line with Kalyca! WE DID IT! 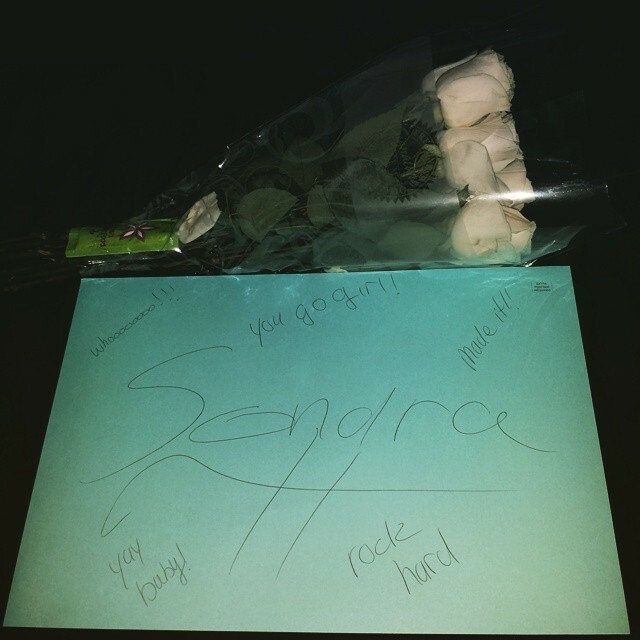 A surprise GIANT card and roses from the best boyfriend ever when I got home! My finishing stats! Because that, friends, is what it’s all about: FINISHING. Unfortunately, I didn’t find a photo of myself on my stats page, which is what held up this post so long. However, you can watch this awesome video of me crossing the finish line! Moral of the story? You can accomplish anything. If I can do a 15K, and still walk the entire week after, it’s not hard. LOL. Set some goals that you never thought you could achieve before. 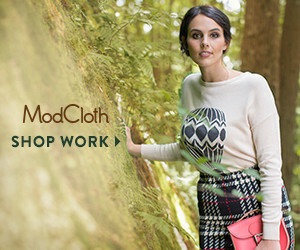 Go ahead and surprise yourself….it’s worth every bit of effort, I promise!